Bryony Dunne’s project ‘They Usually Lie in the Grotto' combines photography, video and installation to present a body of work where documentary merges with fiction and myth. The exhibition opened on 25 September at Townhouse's Factory Space, the venue's first since the building housing it's gallery space partially collapsed. Dunne's work is displayed on the right half of the factory space, sharing the room with the offices, the library, and the arts shop. A long stream of photographs taken at Giza Zoo runs in a single line on the wall like a film reel. At one end of that line a silent video plays on a screen. 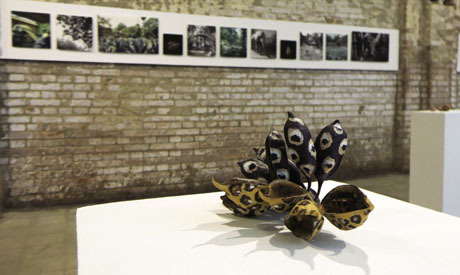 In the space in front of the video and photos is an installation of large seeds that the artist painted on after gathering them from the zoo grounds. They are displayed on tall columns, and so is the self-published photo book which includes more photos and text. They Usually Lie in the Grotto began at the Giza Zoo after Dunne finished working on her film The Orchard Keepers (2014). At the time she was using a very large camera and it drew a lot of questions on the city streets where photographing is often met with suspicion and discomfort. “What interested me in the zoo was that I had some freedom. This place was at the very centre of Cairo, but I found privacy there that made me comfortable to return to it again and again,” Dunne tells Ahram Online. That unlikely sphere of privacy, sheltered from the bustling city outside, the artist explains, gave the place a surreal quality that is subtly reflected in the work. “The grotto itself is like a structure out of a dream. Up-close you can see that different animals are sculpted into it, and the whole thing is made of seashells,” Dunne says. The photos selected by Dunne and curator Sara El-Adl intentionally highlight the aspect of mystery and some abstraction, portraying the zoo as surreal space. For one thing the place feels mostly abandoned, with humans making rare appearances, sometimes only partially visible, and occasionally seen interacting with the animals in captivity. A number of images show just parts of animals, like they’re camera-shy or escaping the frame, while others show them in their cages or captive habitat. The photos are a mix of black and white and in colour, which have an earthy palette of dusty greens and browns. In between these is a different type of photos. Studio photos of the seeds Dunne picked from the ground during her Zoo visits. They are painted in bright patterns mimicking that of wild animals, adorned with tiger’s stripes or a leopard’s spots, and are professionally shot with a black backdrop making them appear to float in a vacuum. “What I did with the seeds was taking something from its place and reinterpreting it,” the artist says. "I wanted to give the seeds a second life, but I also wanted to reference the life they once had: I found many of them lying near the caged animals." With the seeds’ vibrant colours and the playfulness in the act of colouring them, her addition is a lighter element of fun to the deeply introspective project. Sometimes the seeds in the photos loosely echo the shapes in the images displayed nearby; a photo of a long seed is adjacent to that of an ostrich neck, a pointy seed is next to a mysterious animal’s horn. The seeds are photographed like specimens, and how they’re pinned to the wall evokes a museum’s display of samples. This presentation is one of the ways Dunne dances on the line between documentary and fiction. The zoo -- and the neglected grotto within it -- became like a portal to the world we see in her images, or a melting pot for the artist’s thoughts on her surroundings. Animals, plants, and spaces and humans -- these are her raw visual elements. But the work is about more than these; tackling public spaces and freedoms, botanical history, colonialism, and humanity’s actions. Many worlds converge, as she weaves these multiple threads. They Usually Lie in the Grotto is rich with layers, and exudes a gentle power of beauty and seriousness, inviting engagement on many levels; from admiring the visuals, to looking closer and connecting the dots. If the human element took a back seat in Dunne’s photography, it features more prominently in her video and the photo book. In these mediums, Dunne aptly expands on the documentary aspect, more evidently showing the effect of humans and their relationship with all the elements she explores. The video screen is divided into three frames, each one alternating between still shots and video. “Material in the video comes from a larger body of work I’m working on, and this is where I’m trying to work with it with this collection,” she says. Dunne brings in found footage of the Suez Canal, archival photos of the Berlin Zoo opening, scenes from a Zoo in Portugal, and the massive Kew botanic gardens in London. Research thus lead her to European colonialism and the colonial mindset of showcasing animals and plants. Here through video she delves into the concept of collecting, exhibitionism, and what it means to display in zoos and museums. There’s more imagery that highlights the tragedy of animals in captivity. In the displayed photos, there is only one of a rhinoceros in Cairo’s Zoo, a sculpted one. The unique and endangered animal however gets more screen time in the video as a symbol, and as a bridge between fiction and documentary. She includes footage from a feature length video still in progress about the last white rhino in the world. The body of a man with the head of a rhino is looking in the mirror, sitting on a couch, and doing various activities in some scenes that tease for the upcoming film. Dunne traced old mythology surrounding the creature, and linked it with the fragile existence of the world's last male Northern White Rhinoceros currently in Kenya. “For me this species is extinct, they’re trying to revive it artificially, but it’s over,” she says. The seven minute video ends with the artist projecting her own thoughts. “I see the rhino is going back into the earth, into a dark place, back into a grotto,” she says. The work is objective and subjective, outspoken and introspective. “I continuously question myself, what position do I take, and who am I to tell this story? But I think this ambiguity is more interesting to me than answers. We live in a world where we’re told we have to know and find out. But what is left for the imagination? I’m interested in trying to find that space,” Dunne says. With all the richness of material in her work, the artist has room to expand on the multiple threads she un-spooled. A future exhibit in London will focus more on archival imagery, and what a seed bank is. “This is a preliminary of a much larger investigation of what I want to do,” she says. Townhouse Factory, 10 Nabarawy street, off Champolion street, Downtown, Cairo.